Sloan Park (previously known as Cubs Park) is the newest spring training stadium in Arizona and began hosting Chicago Cubs games in the 2014 Cactus League Baseball season. The Chicago Cubs are the only team associated with this stadium, unlike some others where there are two teams that share a stadium. The Cubs used to play at Hohokam Stadium in Mesa, not too far away. The Oakland Athletics moved to Hohokam Stadium from Phoenix Municipal Stadium in Spring 2015. Use this stadium seating chart to determine where your seats will be at Sloan Park. Tickets for Cubs Spring Training are very popular and will sell out. If you don't buy season tickets for Spring Training at Sloan Park, you'll want to be one of the first to get your single game tickets when they go on sale. 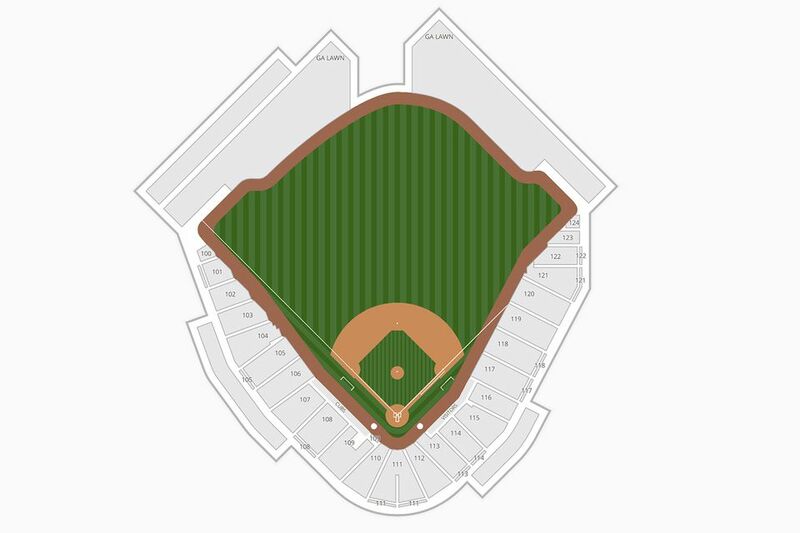 Don't assume that you can buy tickets at the gate, especially if they are playing another popular team like the Arizona Diamondbacks, home favorites. To see the image of the seating chart larger, simply temporarily increase the font size on your screen. If you are using a PC, the keystroke to us is the Ctrl + (the Ctrl key and the plus sign). On a MAC, it's Command+.